Researchers have built the world’s smallest transistor – one atom thick and 10 atoms wide – out of a material that could one day replace silicon. The transistor, essentially an on/off switch, has been made using graphene, a two-dimensional material first discovered only four years ago. Graphene is a single layer of graphite, which is found in the humble pencil. The transistor is the key building block of microchips and the basis for almost all electronics. Graphene has been hailed as a super material because it has many potential applications. It is a flat molecule, with only the thickness of an atom, and both very stable and robust. The researchers are also looking at its use in display technology – because it is transparent. The Manchester-based scientists have shown that graphene can be carved into tiny electronic circuits with individual transistors not much larger than a molecule. Dr Novoselov told BBC News that graphene had many advantages over silicon because it could conduct electricity faster and further. “These transistors will work and work at ambient, room temperature conditions – just what is required for modern electronics,” he said. Dr Novoselov said graphene was a “wonderful conductor”, making it a perfect material for chip applications. “It is already superior to silicon by an order of magnitude and comparable to the best samples of other materials. Graphene is a hot topic among semiconductor researchers at the moment because it is an excellent conductor of electricity. Unlike silicon graphene transistors perform better the smaller they become. The global semiconductor business is currently built on sand; stamping out microchips from large silicon wafers. Companies like Intel have a roadmap to reduce the size of circuits on the silicon wafer, down to about 10 nanometres – 10,000 times smaller than the width of a single human hair. Many researchers believe that producing circuits smaller than 10 nanometres in silicon will be too difficult because they start to leak electricity at that size. That current silicon roadmap is expected to end in 2020, making the race to find alternative materials potentially very lucrative. Producing graphene sheets big enough to be used as wafers for chip production remained the biggest hurdle, said Dr Novoselov. 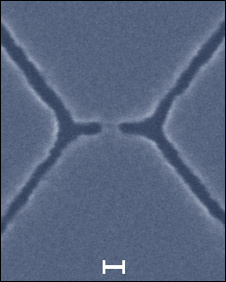 “We can control the cut down to 20 nanometres. And then when we have to scale down to one nanometre we use a bit of luck. Many researchers around the world are working on creating large wafers of graphene. In order to produce microchips wafers would need to be several inches across. The biggest wafer produced so far is 100 microns across, just a tenth of a millimetre. “I do believe we will find the technology to do this. And when we do silicon will be replaced by graphene,” said Dr Novoselov. Professor Bob Westervelt, in an assessment of the material and its future application in the journal Science, wrote: “Graphene is an exciting new material with unusual properties that are promising for nanoelectronics. 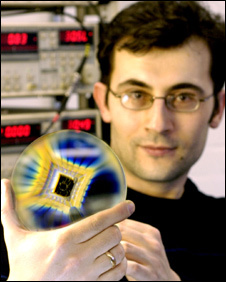 He said the process of using graphene to build circuits was very compatible with silicon technology. But it might be another 10 years before the first integrated circuits on graphene chips appear, he said. In the shorter term graphene could be used in LCD displays to replace materials used to create transparent conductive coatings. “The computer screen relies on good transparent conductors. But current materials are expensive and hard to produce. “Graphene is only one atom thin so is absolutely transparent – it’s a really wonderful conductor. The material is also being touted for use in solar panels, transparent window coatings and also for sensing technologies. Dr Kostya Novoselov and Professor Andre Geim from The School of Physics and Astronomy at The University of Manchester presented their findings in the 17 April issue of Science. Hospital staff at West Georgia Health System in LaGrange soon can view patients’ medical histories, confirm patients’ identities and allergies and coordinate X-rays, lab tests and treatment without using a scrap of paper. The more streamlined operations are one benefit to come with a new advanced health information technology system it is beginning to implement this month, a $12 million system designed by MEDITECH, leading provider of health information systems. The system creates a centralized database of patient medical information and enables officials to automate many clinical, financial and administrative functions. President/CEO Jerry Fulks said such technology will become increasingly important for the hospital. “Better tools, better information and better ways of sharing information will be critical in connecting the health-care community and insuring the safest, best-possible care for the patients we serve,” Fulks said. Less than 13 percent of Georgia’s 170-plus hospitals have implemented such systems, according to the Georgia Health Information Exchange, an organization dedicated to the widespread adoption of health information technology. West Georgia Health System is an early adopter and the first health system nationwide to implement MEDITECH’s newest generation of software, Client/Server 6.0, a system designed for reliability, performance and secure, remote access. The health system is a pilot site for the new technology platform. Early implementation began this month and includes most of the system’s core components. The health system added substantial hardware in preparation, including nearly 90 additional personal computers throughout the hospital, including tablet personal computers for physician use. Instead of gathering patient information on paper, nursing staff will use these mobile devices to log onto the new system and record a list of patients’ medications, allergies and other critical information at the point of care.